We are pleased to announce that Being Human: Call of the Wild is finished. The book can be ordered from the publisher by going to the Catalogue page and filling out (and mailing in) an order form, which entitles you to at least a 30% discount. For an immediate order, the book is available online (e.g., Amazon). Or, you can order the book from your local bookstore (via Ingram Book Co.). Once again, we are grateful to all of our contributors (including those who submitted but did not get into the volume). The contributors are listed below. We are happy with the book (as our consultant readers have been), so we are confident that you too will be quite satisfied. Twelve authors and fifteen stories on the nature of being human and the human character in both the natural environment and human-made world constitute this stimulating book. The stories are engaging, memorable, contemplative, and even humorous. While we have constructed, over thousands of years, a vast cathedral of scintillating, rational humanity, we can be primal and shadowy with visceral emotions – and so this collection admirably demonstrates. There are many difficult questions posed in the book. Why do we kill certain creatures while nurturing others? When do we draw the line between protecting our property and letting other creatures live and thrive? What drives people to kill others to protect their land? Many of these stories explore the lines cast under the surface of creation, characters looking for a nibble of understanding to make better sense of their place in an evolving world. “We are drawn along through humor and pathos into the complexity of human existence, our persistent questions and confusions about our origins, our ultimate place in the universe. . . Being Human wonders in the mysterious, and often whimsical, play of humanity as it interacts with, and seeks solace and identification in, nature.” – Ian S. Maloney, Ph.D., Professor of English, author of Melville’s Monumental Imagination. FOREWORD: Ian S. Maloney, Ph.D.
EDITED BY Scholar, Professor, and Pushcart Prize Nominee, Gregory F. Tague, Ph.D. 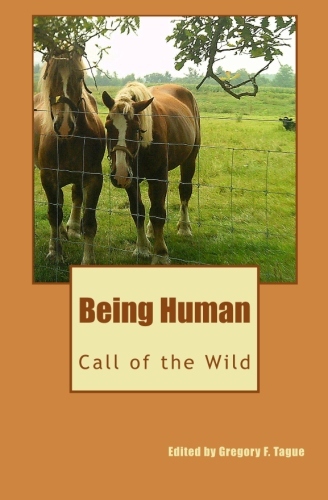 BEING HUMAN: Call of the Wild. (Editions Bibliotekos, February 2012). 166 pages; paperback; ISBN: 978-0982481950. $14.95US; Availability – Individual orders via Amazon.com or B&N online and other online retailers, or ask your local bookstore. Distributed through The Ingram Book Co. Kindle e-Book (Spring 2012), $5.99U.S. · Since November 2009, when we published our first book, Pain and Memory, we have come to work with 58 authors and have published 107 individual pieces. · We have published 17 profiles of creative individuals (and have more in the works). · We have begun publishing book reviews. · We have also worked with students and faculty (8 in all) from St. Francis College on the book projects. · We have sponsored 3 readings at St. Francis College (and expect to have more). · We are now linked with the ASEBL Journal (and blog) – an academic publication that focuses on ethical behavior/evolutionary biology in its articles. · We have one more planned anthology (the Call is up), most likely entitled (and on the theme of) Faith and Doubt. We are not (and do not intend to be) a publishing behemoth. We are happy and proud to have built our group and hope to keep it growing – all of it due in great part to the authors and readers. Thank you for your support, as we work to support the literary community.